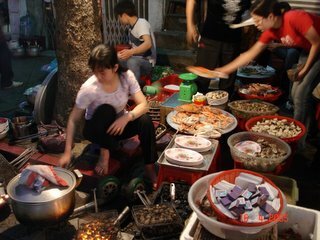 The streets of Hanoi come alive with mobile hawkers and makeshift eateries at mealtime, particularly at start and end of day. There's something new on practically every corner, so you just have to go with your gut (or follow others') and plonk yourself down on a stool somewhere. With some skill and deft planning, you might well sample more than one a night. And if that's your intention, perhaps come equipped with a small stool and soup spoon of your own. A number of peddlars were selling packages of sticky rice wrapped in pandan leaves. For US$0.30, we got a packet of our own. 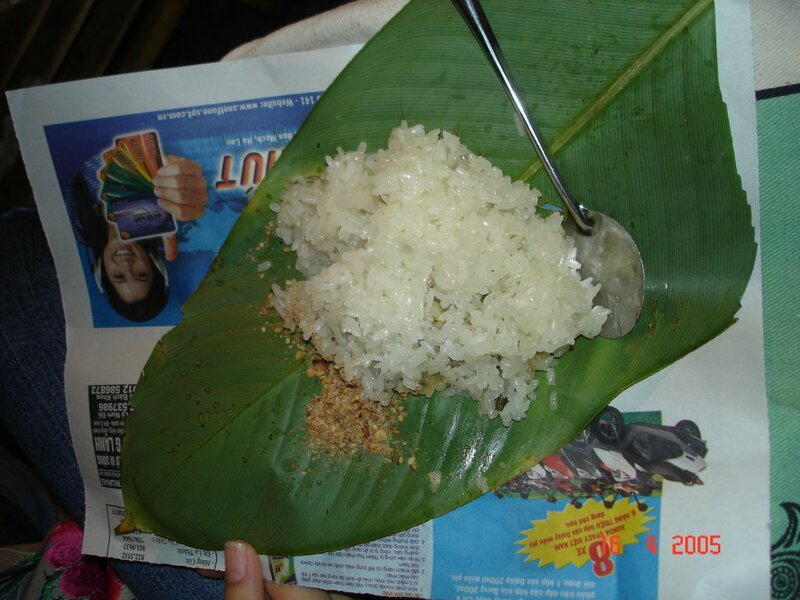 The sticky rice encased a soft, smooth starchy mush, and eaten with salty crushed peanuts, it was surprisingly rather addictive. If only we could find out its proper name, Banh something? 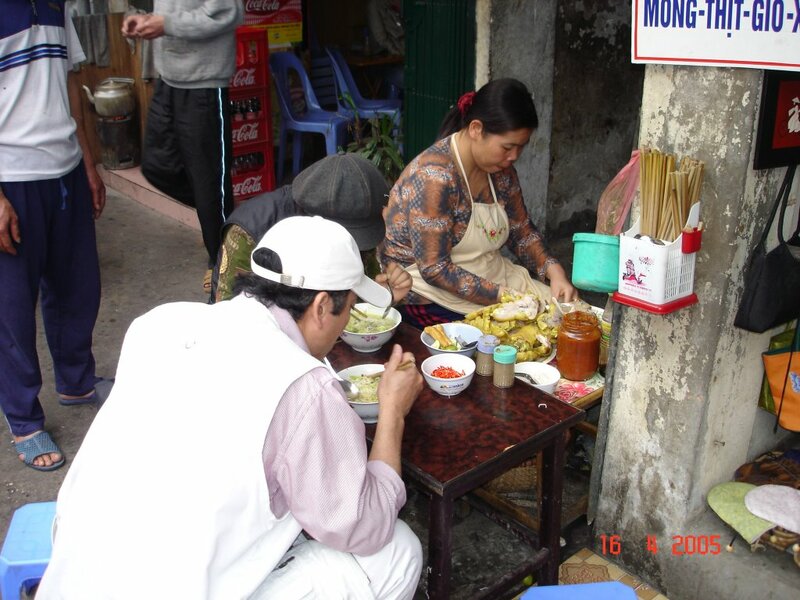 This Bun Ga (bun= rice vermicelli; ga= chicken) stop right across the road from our hotel was a quick favourite. Set up at the mouth of a narrow alleyway, sitting at the table you instantly become part of the family. A bowl of noodles (with shredded chicken and leeks) in a light, refreshing broth cost just US$1, and soup refils were complimentary! On our second visit, we were the last ones at the table, and they actually had to run out to buy noodles especially for us. But, with typical Vietnamese hospitality, we also got to share the family's own special seasoning, and our bowls kept being topped up til there was nothing left in the pot. This seafood stall was so popular the stools extended all the way down the street. And with buckets of fresh crabs, clams, mussels, prawns, oysters, snails, fish on offer, we just had to sit down. Our table was a huge round metal tray perched upon a stool. We settled on a 500g crab and a bowl of mussels which together cost us about US$6. The crab was grilled and the mussels came in a light lemongrass soup. To pique the tastebuds, we got two bowls of dip: one slightly salty, with lemongrass and a hint of lemon, the other a sweet chilli. The seafood was so sweet and flavourful, there was really no need for anything more.